YOUR STORY CAN IMPACT MILLIONS! At Wealth Through Stories LIVE! we will lay the foundation so you can begin to find the wealth in your story. How to find, create and tell your story with simplicity and ease. How to use story to connect with the people you want to reach. How to use story to transform a potential lead to becoming a paying client in 2 minutes or less. For More on Wealth Through Stories LIVE! go to Story Retreat. Linda Olson is the Founder and CEO of Wealth Through Stories, International Speaker and Story Expert. Linda shares the transformational power of story and shows you how to find the wealth in your story. If becoming a better storyteller interests you, or you’d like to have me speak for your group or organization, I invite you to continue looking through this website. You will have opportunities to download information, sign up for a Free Consultation, and join me and others at Wealth Through Stories LIVE! Is committed to helping you find your key stories and impact the people you want to reach. Will help you create your Brand story and show you how you can reach millions. To help you improve your skill in storytelling, I encourage you to sign up for What are You Really Offering? 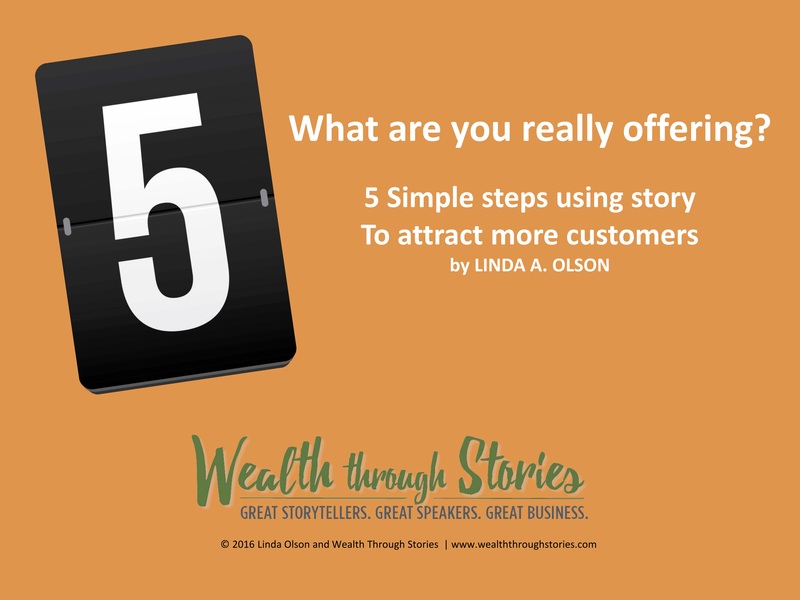 5 Simple Steps to use Story to Attract More Customers. Just click on the button below and enter your name and email.